This information is shared by request by Xara Choral Theatre. Does your family have a story? A Nova Scotian performance ensemble is seeking out information about of local women who helped in the relief efforts of the Halifax Explosion. Xara Choral Theatre Ensemble will be touring a show called The Hours Turn to Nothing to Annapolis Royal at Kings Theatre on June 10, which tells the story of nurses and midwives who came to the aid of pregnant women and many others who were hurt in the 1917 disaster. Historical documentation has revealed that women were specifically requested to support the relief effort, in part because many pregnant women within range of the blast were jolted into labour. The Halifax Explosion was the largest man-made “bomb” in history until the dawn of nuclear weapons in the 1940s. Records from December 1917 show that relief workers came from all over the Maritime provinces and as far away as Boston. A number of first-hand accounts exist from medical personnel; however, stories of women and children are frequently left out of the historical record. Xara Choral Theatre wants to help correct the oversights of history. 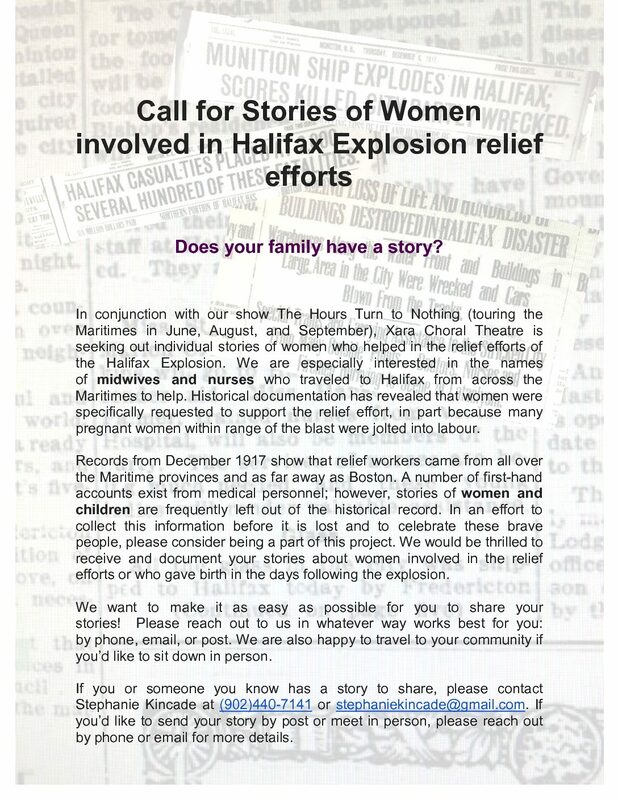 If you or someone you know has a family story about a woman who was part of the Halifax Explosion relief efforts, Xara Choral Theatre Ensemble would like to hear from you. They are making it as easy as possible for people to share their stories, offering the option of phone conversations, email accounts, written submission via post, or in-person interviews. If you have a story to share, you can contact Stephanie Kincade at (902)440-7141 or stephaniekincade@gmail.com. If you’d like to send your story by post or meet in person, Xara Choral Theatre requests that you phone or email to set this up.